For horses that are bleeders or have COPD, we have several options to help you make the right therapy care choice for you and your horse. The first method is using microcurrent therapy (MCT) and following the Lung Setup protocol, which is described in our Quick Guide: MicroCurrent for Bleeders by Deborah Powell. It’s impossible to name a more valuable overall treatment that you can give horses, even with the steady stream of new products entering the market. MicroCurrent remains a classic that can be counted on to help horses feel better. This is because MCT can benefit the entire horse and help a multitude of conditions. The only drawback to microcurrent is that it takes a bit of willingness and effort to do the therapy, but that has become a whole lot easier with new application methods. Frustrated by all the other things he had tried, he decided to give it a go and purchased a basic microcurrent device and the Matrix Silver Knit Back Pad electrode for sore backs. He has been thrilled how much it has helped and recently added the protocol for bleeders and COPD to his regimen. Luckily he realized it was NOT that intimating after all. Microcurrent treatment with backpad electrode. And VibraVM treatment using the open-nose applicator over the horse’s nostril. 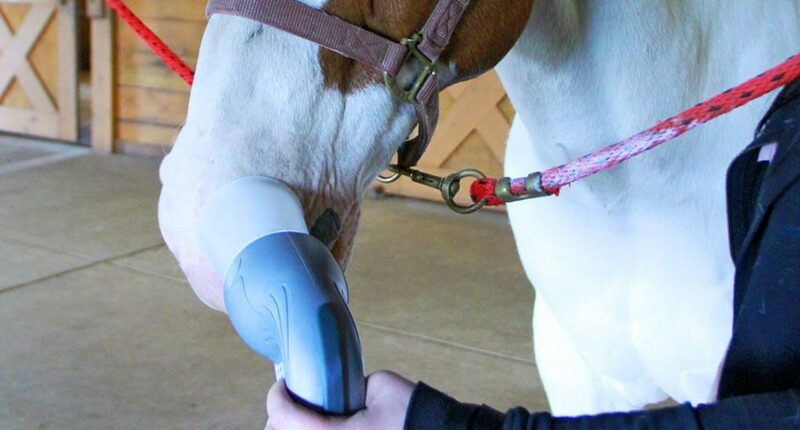 The other option is using the VibraVM, which is a therapy tool specifically for equine respiratory issues (learn more). The VibraVM is for horses (or other animals) with more serious respiratory conditions such as heaves, COPD, or horses with a history of exercised induced pulmonary hemorrhage (EIPH or bleeders). The VibraVM is an acoustic percussor with specialized sets of frequencies that sound like a musical instrument followed by a white noise massager setting. It is applied directly at the nostrils by holding it up to the horse’s nose. The VibraVM is designed to first target and release trapped mucus. Second, it helps to relax restricted lung passages to improve oxygen flow. With the goal of not only improving lung function but to help the lungs heal. After the initial introductory session, the entire treatment process is completed in just a few minutes. With a horse’s performance directly affected by respiratory conditions, Microcurrent and the VibraVM can be part of a positive overall program for assistance in comfort and lung maintenance that is drug free.